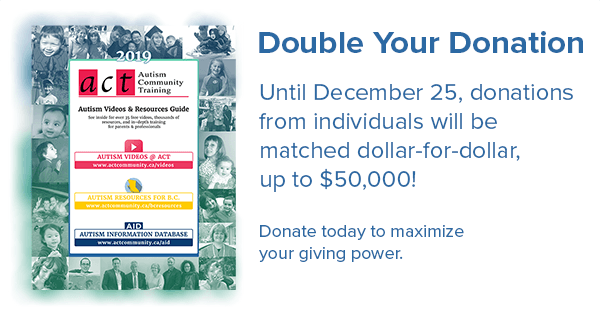 As of December 18th , ACT has received over $31,000 in our “Double Your Donation Campaign”, made possible by the extraordinary generosity of Blair Dwyer (donor, sponsor and presenter) and his wife, Mary Ellen Ross (former ACT Board Vice-President). They are offering up to $50,000 in matching funds for donations from individuals. The $31,000 we have received translates to $62,000 – but we still have $19,000 to raise by December 25th! Why has this Dwyer-Ross family chosen to support ACT? “The reason for the gift is really quite simple. We feel a tremendous debt of gratitude for all the help that ACT gave to us in raising our two children. They are both doing better than we could have thought possible after we learned of their diagnosis. ACT is a big part of that.” explains Blair Dwyer, who is well known to the autism community thanks to his presentation available on Autism Videos @ ACT – Taking Control of the Future – Planning for Families with Children with Special Needs. ACT will keep you posted on the campaign right up until Christmas via our Facebook page. There you can read why this weekend’s donors (including a researcher, a teacher, several parents, OT’s, SLP’s and Behavior Analysts, a grandparent, and a sibling) have given to ACT. Do you have words of encouragement for ACT’s campaign? Has ACT made a difference to your family or the people you work with? Have you benefited from an ACT bursary? Post your thoughts on Facebook and encourage others to donate! This holiday season, we are sharing with you the new 2019 Autism Videos & Resource Guide – 12 pages of free online resources, including our new offerings for the Online Mental Health and Autism Project. This has been a very productive year with 14 live events and 13 new online videos. For details see ACT’s accomplishments for 2018. In the process, ACT has drawn heavily on our financial reserves to fill the funding gap left by the 2017 cancellation of ACT’s government contract. Despite ACT’s track record, the BC government has not responded positively to requests to support our live training program utilized by nearly 2000 registrants in 2018. However, we have heard from hundreds of our users, urging ACT to continue our work as an independent promoter of a range of evidence-based resources. Many share our concern that families of children with autism and related disorders are very vulnerable to false claims; ACT’s free information resources are used by thousands of parents and professionals each year because they promote evidence-informed practice. ACT’s library of nearly 40 online videos brings immediate access to clinical expertise to the autism community nationally and internationally. No password or registration is required for ACT’s wide range of free resources as one of our core values is make reliable information available to all to encourage informed decision-making. While ACT remains committed and enthusiastic about meeting the vital training and information needs of the autism and special needs community, we are facing an economic reality: unless we are successful in fundraising $200,000 in the next three months, ACT will not be able to provide live and web streamed training in 2019. If the autism community can meet the challenge and raise $50,000, ACT will receive another $50,000 from Blair Dwyer and be halfway to our goal. What are ACT’s Training Goals for 2019? ACT is seeking $200,000 in funding to present 10 web streamed events in 2019, up from five in 2018. These will build on the tremendous response we have received from schools, clinics, agencies and families across BC and beyond. Registrants tell us they are thrilled to be able to watch and listen to live presentations from leaders in the autism field that address the complexities of living with autism from a practical perspective focused on quality of life – without the costs of traveling to Vancouver. Just what those topics will be depends on a survey of our users which ACT is planning for January 2019 but we guarantee they will be thought provoking, practical and respect the diversity of the autism community. ACT fills a province-wide training gap, which does not fit neatly into the mandate of any one government ministry. In the absence of government funding, we require an average of $20,000 per event to cover our overheads and to allow us to keep the cost of registering to a reasonable amount and allow us to continue our bursary program. $200,000 in donations and/or event sponsorship will allow us to meet this ambitious goal. ACT’s free online resources are available 24/7, bringing evidence-based accessible resources to autistic adults, families and professionals with a simple keyword search. To remain useful, our databases and online videos must be maintained and updated. ACT’s resources have developed organically for over a decade, based on our experience of community needs, now we are calling on those who understand the diverse needs of those with autism and their families to support our commitment to remain an independent, active promoter of best practices in autism treatment, provincially, nationally and internationally. Over 1,200 keyword searchable records on B.C. community resources ranging from speech pathologists to community groups, the most comprehensive database serving the special needs community in BC. Over 1,400 searchable records linked to resources available internationally in over 30 languages. Overseen by a panel of international experts, the AID provides families and community professionals with resources that are practical and evidence-based. Nearly 40 online videos, from toilet training to mental health, provide instantly accessible information from leading clinicians and researchers to address practical priorities. Each video has been edited into to short segments that can be shared. No password or membership is required. We hope that you will consider donating to ACT before December 25th so that ACT can benefit from the extraordinary generosity of the Ross-Dwyer family which will double your contribution. ACT is a federally registered, not-for-profit society and we provide tax receipts. You can donate via Canada Helps by credit card, via telephone or by cheque. Donating by December 31st ensures that you receive a tax receipt for 2018, reducing the amount of tax you pay. ACT can provide our audited financial statements for 2017. Need more information? Email ACT’s Executive Director, Deborah Pugh dpugh@actcommunity.ca or call the ACT office. This entry was posted in fundraising, News on December 3, 2018 by ACT.